← Ep. 7 "Chaos Theory"
We really have to figure out other ways to flirt. This one was IMO the best episode of this season so far. 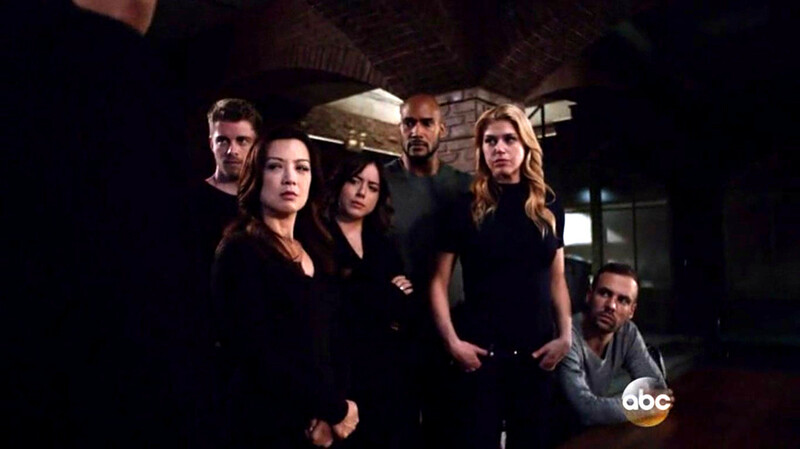 I liked it so much that even the storyline that I usually find most annoying (Ward) wasn't so bad this time, and Ward himself seemed less irritatingly stupid than usual. Lincoln remained with S.H.I.E.L.D., it seems he's going to become an agent. I keep liking Mack more and more, although in this episode he doesn't do anything special, I realized that I totally re-evaluated him and he's becoming one of my favorites. Hunter, however, is always the funniest, in this episode he goes undercover with Bobbie in the role of an irritating and anti-American hacker: adorable! :) And I loved even their code names: "Blonde" and "Brit". they finally kiss!!!!! But unfortunately their relationship is still far from stabilized, they're cursed, Fitz says. 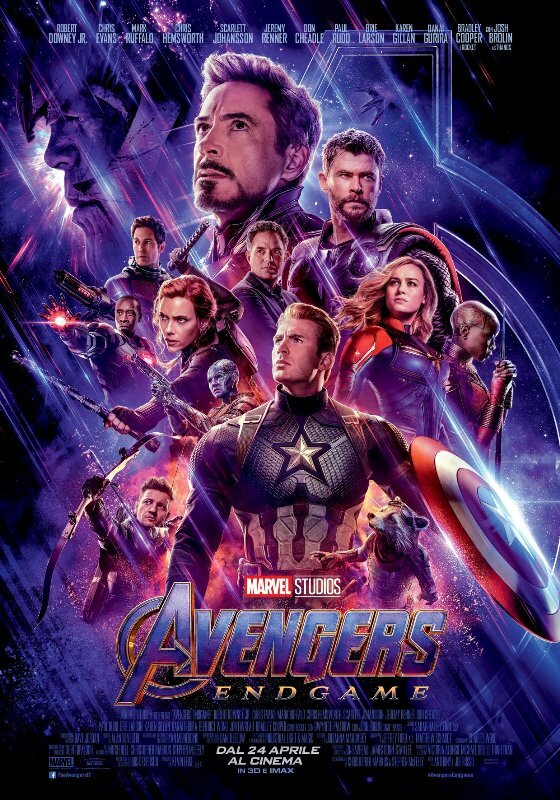 Nevertheless they continue to work on a way to bring Will back, and they discover that his mission was actually kind of a human sacrifice from a secret organization that has existed for centuries, changing over time, and is nothing more than Hydra today! when he announces operation Spotlight, or let's spy ATCU. And ok, I have to say that now that I'm no longer worried about Coulson's intentions, I find he and Roz almost cute: they call each other "dearest" while hiding a lot of things, and lying, and spying on each other all the time, (see the quote at the beginning of this post). 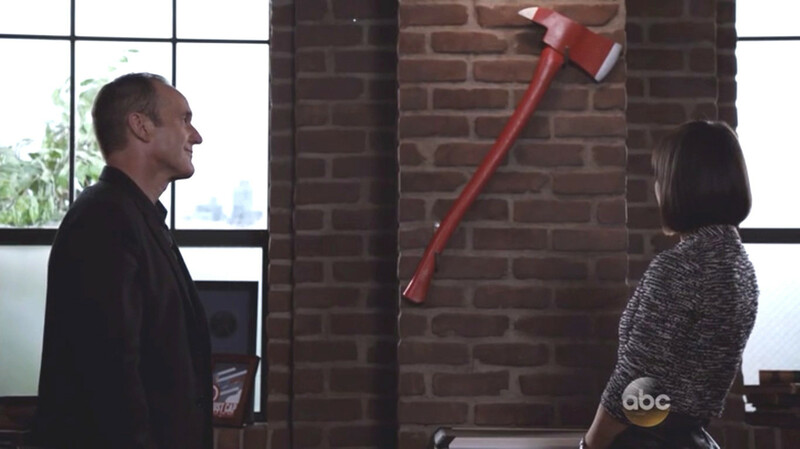 Phil brings Rosalind on a tour of the base, and also shows her his office with his collection of old spy gadgets, and we see that he has hunging on the wall the ax with which Mack cut his hand. A little morbid as souvenir! Anyway, among other things Coulson reveals a bit of his past, we don't know if he was telling the truth, but I like to think he was, because this way we can know a little more of this the character! He studied History at the university, and in this way he discovered how much of this history S.H.I.E.L.D. helped to shape, and so he was recruited just after college. Come with me, I'll get you out of here. If you're worried you can't trust me, worry on the move.